Duomo di Ravello and Villa Rufolo are good opportunities to explore the local culture. We've included these beaches for you: Fornillo and Bagni d'Arienzo. 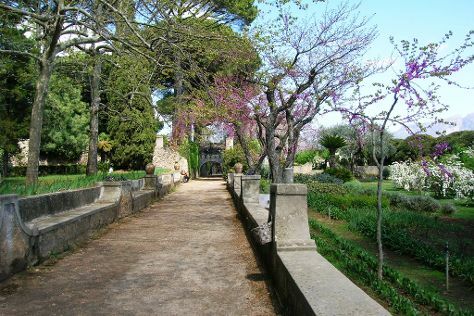 There's lots more to do: contemplate in the serene atmosphere at Duomo di Sant'Andrea, take in the architecture and atmosphere at Santuario della Madonna del Rosario, kick back and relax at Lido di Ravello, and take in nature's colorful creations at Villa Cimbrone Gardens. To find traveler tips, where to stay, other places to visit, and other tourist information, refer to the Amalfi day trip website . Goiania, Brazil to Amalfi is an approximately 23-hour flight. The time zone difference moving from Brasilia Time to Central European Time is 4 hours. Traveling from Goiania in August, you can expect nighttime temperatures to be somewhat warmer in Amalfi, with lows of 28°C. Wrap up your sightseeing on the 8th (Thu) early enough to drive to Salerno. On the 9th (Fri), explore the ancient world of Paestum Ruins, delve into the distant past at Il Tempio di Nettuno o Poseidone o di Hera II, then explore the ancient world of Museo Archeologico Nazionale di Paestum, and finally make a trip to Promenade Trieste. Get ready for a full day of sightseeing on the next day: contemplate in the serene atmosphere at Chiesa di Sant'Agostino, take in the architecture and atmosphere at Duomo di Salerno, admire the striking features of Villa Guariglia, then explore the world behind art at Museo provinciale della Ceramica, then do a tasting at Le Vigne di Raito, and finally kick back and relax at Spiaggia di Marina d'Albori. To find traveler tips, reviews, and tourist information, read our Salerno online trip itinerary maker . Salerno is very close to Amalfi. In August in Salerno, expect temperatures between 34°C during the day and 28°C at night. On the 11th (Sun), wrap the sightseeing up by early afternoon so you can travel back home.